Lilongwe, Malawi, May 22, 2018- To help detect and stop smugglers carrying ivory, rhino horn, and other wildlife products out of Malawi, the USAID Reducing Opportunities for Unlawful Transport of Endangered Species (ROUTES) Partnership delivered a training workshop for airline transport staff on the key role they play in preventing the trafficking of wildlife. 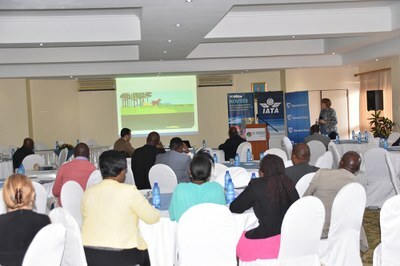 The workshop was held as part of IATA Day Malawi, which focused on the Role of Aviation in the Sustenance and Growth of Malawi’s Economy. “People want to come to Malawi to see everything including the wildlife. There is hope here that this meeting will allow us to protect our wildlife and promote tourism,” said Dr. Mary Shawa, Director of the Malawi Ministry of Transport and Public Works. According to a recent ROUTES report analyzing wildlife trafficking in the air transport sector, Malawi serves as a significant transit point for poachers and traffickers supplying wildlife products to Asia. The training in Malawi was part of a series of training workshops that ROUTES will conduct for airport and airline staff this year at key wildlife trafficking hubs across Africa and Asia. ROUTES recently conducted trainings in Kenya, Malaysia, Mozambique, Singapore, and South Africa and over the next few months, ROUTES will hold training sessions in Ethiopia, Uganda, and Turkey.